Ever get tired of the same old color for weather icons? For those that love to customize their device, having themed icons are a must. 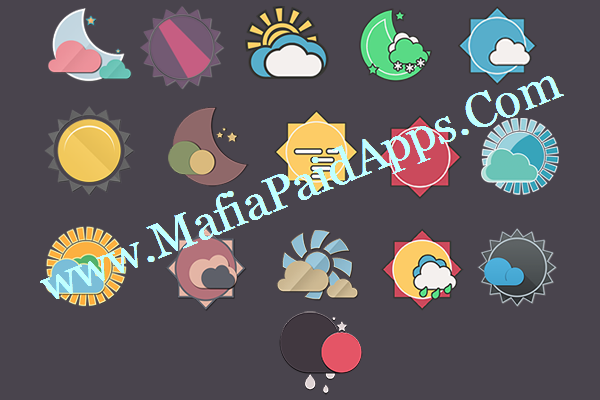 This app provides that for you in weather icon sets to be used with Zooper Widget Pro. With these sets, you can now match up your screens to the icon pack for a beautiful customized look. This is not a stand alone app, you MUST have Zooper Widget Pro installed. If you don't the sets won't work. *On homescreen, add a zooper widget. ( long press on homescreen if you are using a launcher or appdrawer if you're on stock ROM). *If the widget already has a weather set included, go to layout, scroll to bitmap icon set, select that, and a list will appear of installed weather sets. Pick the one you want. You can than scale it to the size you want or move it around. *If the widget does not have a weather set included, go to layout, add item (up top + sign) then choose bitmap iconset. Also thanks to my many supporters on g+ who tested and used the sets and for their continued support!